GTS no longer offers decompiling services. 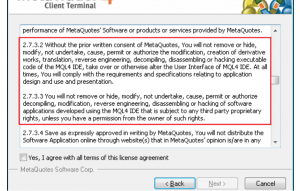 Whilst we believe it is up to the owner/submitter of EX4/MQ4 files to decide if they are breaking any copyrights and are not the legal owner of the files MetaQuotes (owner of MT4) have decided that the following agreement signed by users of MT4/5 prevents GTS from providing any decompiling services. GTS would like to point out, that we did not decompile EX4’s ourselves and files were always passed to a 3rd party. Further, for GTS to be in breach of the above agreement GTS itself would have to have to have agreed with “terms of the license agreement” which is only available to those who use the platform/indicators/expert advisors. That being said, we have agreed to remove the offered service as we have no desire to upset anyone as we think it is important that the trading community operates honestly and with integrity. It should be known that Metaquotes made no attempt to contact GTS directly and filed a legal “Notification of Claimed Infringement” with the host of GreatTradingSystems.com.